Around twenty years ago I wrote that while the twentieth century had been the era of management, with its new management schools, management consultants, and management gurus, the twenty-first century would be the era of corporate governance. Corporate governance has certainly now moved centre stage. Google has 52 million references to the phrase. Interest in corporate governance has flourished. The late Sir Adrian Cadbury wrote the first corporate governance code – the UK’s Financial Aspects of Corporate Governance (1992). He always emphasized that his report was not a comprehensive approach to corporate governance, but focused on the financial aspects. Nevertheless, he made proposals that are still pertinent ̶ the creation of board level audit committees, remuneration committees, and nomination committees, with independent outside directors; the separation of the board chairman from the CEO; and public reporting that the company had complied with the code or explaining why it had not. Since then, corporate governance codes, often as stock exchange requirements, cover almost all listed companies around the world. But despite countless amendments, revisions, and rewrites most corporate governance development has been piecemeal. There has been relatively little original thinking. Most codes still adopt Cadbury’s voluntary ‘comply or explain’ approach. The principle exception is in the United States, where regulation and legislation are used to oversee the governance of corporations. 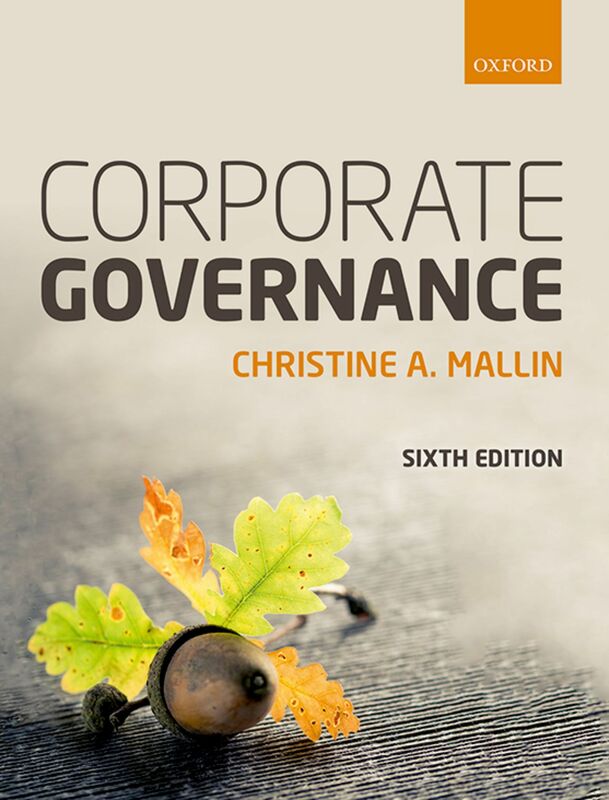 The development of corporate governance practice has almost always been in response to corporate failure or economic malaise. In the United States, the Securities and Exchange Commission (SEC) was set up in 1932–3, after the stock market crash of 1929 and the great depression that followed. The Cadbury report responded to concerns about corruption found in UK Government inspectors’ reports on failed companies including the collapse of Robert Maxwell’s’ corporate empire. The US Sarbanes-Oxley Act (SOX 2002), was a response to the failure of Enron, Waste Management, and other companies, followed by the folding of the ‘Big Five’ accounting firm, Arthur Andersen, reducing the big five to the even bigger four. Unfortunately, SOX did not prevent the global financial crisis, starting around 2008, in which US companies such as Lehman Brothers failed and American International Group, Fannie Mae, Freddie Mac, and others were bailed-out by the US government. The result was further federal legislation. The Dodd-Frank Wall Street Reform and Consumer Protection Act of 2010, called by some SOX 2, attempted to improve American financial regulation and the governance of the US financial services industry. As yet, no over-arching theory of corporate governance has emerged. New thinking and new ideas are badly needed in the governance of organizations. A fundamental governance question for the modern public company, for example, is: What role should the shareholders play in corporate governance? In the original mid-nineteenth model of the joint-stock limited liability company, the shareholders were mostly individuals–aristocrats and members of the newly forming affluent middle class. These shareholders appointed the directors who reported to them on their stewardship of the company. The directors may have known their shareholders personally. Shareholder meetings and votes were the way boards of directors were held to account. Indeed, in the original model accounts were audited by an audit committee, elected from among the shareholders themselves. But today, individuals running their own portfolios form only a small part of the shareholder base. These ‘retail shareholders’ typically have relatively small holdings and little influence. They might also include directors, executives, and other employees of the company. sovereign funds, using state capital to invest, possibly with political or economic implications as well as financial interests.Concerns over corporate behaviour, such as allegedly excessive director remuneration, unclear or over-ambitious corporate strategies, or the lack of board diversity have led some politicians and other commentators to call for shareholders to exercise their duty to oversee board behaviour more fully. This has led to the emergence of proxy advisers; firms that study issues facing companies and advise institutional investors on voting decisions. But votes in shareholder meetings are advisory; exhortatory at best. Shareholders’ votes do not bind the board. Directors do not have to follow them. Energetic efforts by some institutional investors, including grouping together, have not changed the underlying power structure. Bob Monks, in his book Corpocracy (New York: Wiley, 2007), showed how power had moved over the years from owners to directors. Concerned by what he saw as an abuse of power, he co-founded Institutional Shareholder Services (ISS) in 1985 to wage proxy warfare on companies. These proxy battles continue to this day. However, the fundamental question remains: In the modern public company what should the role of shareholders be? Is it, on the one hand, to preserve the nineteenth-century legal concept of the corporation–that the shareholders own the company and are expected to play a basic role in its governance by electing the directors and holding them to account. Or is it, on the other hand, for the shareholders to accept a corporate stakeholder role providing finance, just as suppliers provide goods and services, customers produce sales revenues, and the employees provide the work force? I have just completed a study on shareholder communication for the Hong Kong Institute of Chartered Secretaries, which will be published shortly and duly noted in this blog. In a survey Hong Kong’s listed companies gave overwhelming support for the idea that shareholders should exercise a stewardship role in the governance of listed companies. In this they are in line with the opinions of many authorities around the world–regulators, legislators, and corporate governance commentators. Had the alternative view been taken, that shareholders are just one of the various stakeholders in a corporation, appropriate governance models could be developed. The German supervisory level two-tier board could provide a start; members are nominated to represent both labour and capital (the employees and the investors). Representatives of other stakeholders could be added. Thus UK company law now requires companies to consider employees, suppliers, customers, and other business partners, as well as the community and the environment, in their decisions. However, if shareholders are to continue to be a responsible part of the corporate governance mechanism, how might that be achieved? If shareholders are really to affect corporate governance in the companies in which they invest, they need more power. New corporate governance models will have to be devised. One idea might be a Shareholder Senate. A Shareholder Senate would be a new governance body set mid-way between the company and the body of shareholders. Members of the Senate would be nominated by long-term institutional investors and elected by all the shareholders. The Senate would meet formally with the board’s remuneration committee, its nomination committee, and its audit committee with the auditors. Periodically, it would have discussions with the Chairman and the entire board. It would also meet independently to formulate reports and make recommendations to shareholders. The overall responsibility for the company and its management would remain with the board of directors. The Senate would have the authority to question, to advise, and to influence the company on its strategies, operational performance, and financial matters. For example, a Senate could question and challenge levels and methods of executive remuneration, the adequacy of risk assessment systems, the balance of skills, experience, and adequacy of the directors, and confirm that succession plans existed for all senior executives. The Senate would not have the power to block the board’s decisions, nor could it hire and fire directors (as the German supervisory board can). But it would have the responsibility to liaise with the shareholders, and the power to recommend how they vote on specific motions. It could also introduce motions for shareholder meetings. Over time, Shareholder Senates would supplement and probably replace the work of proxy advisers. Shareholder Senates would become a fundamental component of companies’ corporate governance structures and processes. Accordingly, members of the Senate would have fees and expenses reimbursed by the company, just as non-executive, outside directors have. The company would be responsible for publishing Senate reports and other communications with investors, just as it publishes other corporate reports. Concern might be expressed that members of Shareholder Senates would receive unfair insider information. But Senate members could be placed in a similar position to directors who may not trade shares prior to the announcement of results. In fact, Senate members would be in a less exposed position than a nominee director elected by a major shareholder, because they would not attend board deliberations. In fact, it would not be difficult to introduce a requirement for shareholder senates into companies’ legislation or to include them in corporate governance codes, operating on the ‘comply or explain’ principle. The proposal for Shareholder Senates will not be welcomed by most directors and their boards, because they would inevitably mean a shift of power away from the boardroom back to the owners. However, there was plenty of antagonism in British board rooms to the original Cadbury Report proposals: many thought independent outside directors were an unnecessary imposition and an infringement of executive directors’ right to run their own companies. There is little doubt that Shareholder Senates will not be achieved without legislation and regulation. Such developments could be prompted by the ongoing dissatisfaction with the governance of the modern corporation. The newly appointed British prime minster, Theresa May, following the UK’s referendum vote to leave the European Union, mentioned problems with the governance of British companies in her inaugural statement. Corporate governance evolves. Dissatisfaction exists over the present corporate governance model. Some boards readily accept a responsibility to engage with their shareholders. Others do not. Some companies are run for the benefit of their owners. Others are not. Criticisms multiply of board-level excess, particularly over board-level remuneration. Shareholder Senates would provide an opportunity to re-establish owners’ rights. They would give investors a more effective say in the governance of their companies. Power would no longer be abdicated by the owners to the directors.